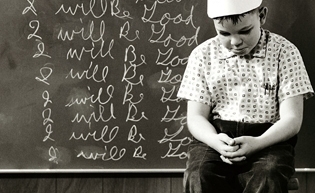 When Did Discipline Become a Dirty Word? God has such a sense of humor. When Linda and I adopted our three younger kids, we knew we would be jumping back into the world of disciplining children all over again. What we didn’t realize was how much God was going to teach and discipline us. Trust me; I’m no different than the kids. I hate being disciplined. After 30 plus years of this parenting approach, we are now seeing the byproduct - many entitled, self centered men, women, and children. It’s the “Me first. I deserve better. All things must be fair and equal.” trap. This approach to life and to parenting only creates victims and entitled individuals, but I think there is hope on the horizon. I believe the tide is starting to change in our homes. Parents are slowly realizing that the above approach didn’t work. Many parents are returning to a more common sense, biblical approach to parenting and discipline. Experts are calling this new approach-Growth Mindset. What exactly is Growth Mindset you may be asking? To keep it simple, Growth Mindset is about letting your child struggle and problem-solve. It’s about delaying gratification and ultimately helping your child understand-life is not always fair and easy. It’s about encouraging and disciplining your child to never be a victim, but rather, be a person who learns from both the good and bad in their life. It’s about not “saving” your child from life’s difficulties or inflating them to be something they’re not. Growth Mindset is about strengthening your child through trials, experiences, losses, and wins. It’s about teaching your child the value of self-control, hard-work, and integrity. As much as we hate to admit it, discipline is the foundation of self-control. Good character, self-control, and working through failure as a child have proven to be the most solid indicators of a well-adjusted, successful adult. As I frequently remind my kids, “I discipline you now, so that hopefully, you will learn to self-discipline later.” None of this is really new. In fact, it’s biblical. For the Spirit God gave us does not make us timid, but gives us power, love, and self-discipline. 2 Timothy 1:7. No discipline seems pleasant at the time, but painful. Later on, however, it produces a harvest of righteousness and peace for those who have been trained by it. Hebrews 12:11. The apostle, Paul, and the writer of Hebrews knew how important discipline was back then and how important it would be to us today. Like most things in my life, I like to keep things simple. My simple mind and approach to life is what gives me peace, and I want our home to be a “house of peace”. Of course, we have our crazy days like any family does, but our home runs so much smoother if the tension is out and peace is in. Next week, I’ll be sharing my top ten list of things we as parents can do to bring peace into our homes and give our children the discipline and structure they need. Don’t miss it.